Author of thirteen books and a long list of articles and chapters, with a select list of journal articles citing 99 articles, the volume of Dr Kerr’s publications is not the most remarkable feature of her work. Nor is it that Ruth’s research and writing encompasses all fields of history: public and private, professional and amateur, academic and consulting, local and global. The remarkable feature of Ruth’s prodigious publication history is that it is the product of her ongoing, passionate and wide ranging historical interests which has moreover resulted in her mastery of several quite diverse fields, particularly in mining, railways, pastoral, economic, administrative and indigenous history. 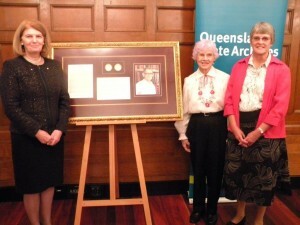 Her knowledge and understanding of Queensland archival resources for historians is ‘unsurpassed’. Dr Kerr’s generosity to other researchers is another of her acknowledged personal and professional qualities. Ruth is ‘enormously helpful to anyone researching Queensland’s history, using her vast knowledge to assist students, professional and academic historians and the wider public.’ Such warm-spirited cooperation is not always the norm among professional researchers. Ruth has always understood the important contribution made to historical knowledge by historians and amateur volunteers working in local communities. She has provided exceptional encouragement and a lot of hard work in the field of local history, both at the local community level and through the Royal Historical Society of Queensland and the Federation of Australian Historical Societies. Ruth’s extensive network of academic, community, state, regional and local history contacts is a testament of her industry and generosity. Dr Ruth Kerr is a most deserving and respected recipient of the 2013 John Douglas Kerr Medal of Distinction. We, her colleagues and fellow students of history, present this award as a tribute and witness of our esteem, and to acknowledge Dr Ruth Kerr for her excellence in historiography, historical research and writing in the context of Queensland History. PHA Qld Patron Clive Moore in Solomon Islands!